Do you like live jazz records? I like them. Being improvisational, intimate and warm, jazz has always been attractive in live performances when the musicians are with the audience and creating real-time music. It is a common chat issue among jazz listeners that a jazz band is far better in live than their studio records. Then if the record quality can carry the ambiance successful enough, we can say that live recorded albums are precious both for the band and its international followers. 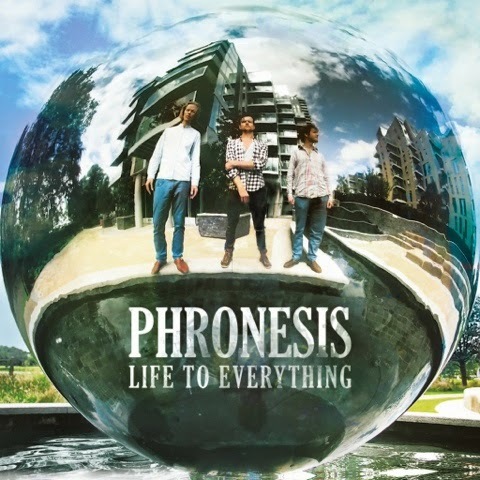 Such an album came from Phronesis in April 2014 via Edition Records: Life To Everything. 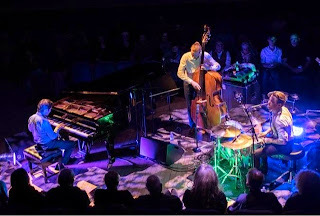 The album was recorded live at Jazz In The Round, The Cockpit, London on 16 & 17 November 2013 during EFG London Jazz Festival. 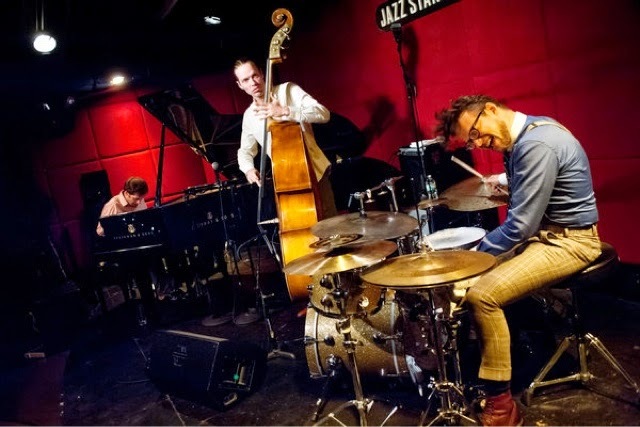 Founded in 2005 by London-based Danish bassist Jasper Høiby (with English pianist Ivo Neame and Swedish drummer Anton Eger) Phronesis is now a prominent European Jazz Trio with their 5th album (last three of them are from Edition Records). This last live album proves that they completed their first development phase and came to a mature level from which they are ready to enlarge horizontally and enjoy this dignified state of mind. The compositions and improvisational performances of the album are both for hearts and brains. They are not only catching you with their familiar rock, folk and jazz textures but also presenting a continuous progress which drives you to follow what's going on with fresh and stimulated transducers. Followers of Phronesis are already familiar with the energy of the band, their ever evolving musical tension and the harmony between the members during their live performances. In this new live album, whose title is a dedication to a quote of Plato about music, we once again face to these characteristics of them. With this second full-live album of their career, they show that they are certainly a live-band and they feel the jazz on their fingers when sounds are reflected from the audience. Besides, there is an interesting point about an ongoing development in their promising musical resume: The dominance of Jasper Høiby for the compositions is decreasing with each album. Each member of the trio has three compositions in 'Life To Everything' (whereas Alive was full of Jasper's compositions and half of Walking Dark is composed by him.) One can easily notice that each musician dominates the performance of his own composition with more partitions, solos and leading roles. This is good to see each members' contribution to the resultant well-known unique Phronesis' sound which - I think - may be even better when we start to see full collaborative compositions of the trio. The album starts with Anton Eger's 'Urban Control' and it ends with his two other compositions: 'Herne Hill' and 'Dr Black'. 'Urban Control' has a signature-like bass entrance. Anton Eger is very sharp and fast while following the dialogue between Jasper Høiby and Ivo Neame and he is actually leading the band in some parts. There are many different phases in that piece who is visited and left many times, which makes me feel like watching endless waves in the sea. 'Herne Hill' carries many different up and mid tempo popular/folk themes connected successfully to each other. Anton Eger dominates the energy of the piece while Ivo Neame is mostly responsible for the main theme. Jasper Høiby both followes a steady -but not recessive- bass line at the back and contributes to naive parts in the middle with his some melody based partitions. 'Dr. Black' is again a catchy composition and this progressive work's first part is introduced by the piano which is then followed by a well known -sometimes marching like- drum rhythms of Anton Eger. The more energetic second part is routed by Anton Eger and there are many surprising rise and falls in the tension in this part. The last part includes an amazing drum solo in which Anton Eger starts from nothing and connects his composition to the end of the album. 'Phraternal' from Ivo Neame starts with an undetermined piano and bass dialogue. When Jasper gives up his bow and holds the strings, the melancholic -almost Nordic- main theme shows his face through the piano between clouds. Ivo Neame is given a wide space above a solid drum and bass structure where he can freely express himself. The third performance is Jasper Høiby's 'Behind Bars' and it starts with a masterwork solo introduction of himself carrying the Phronesis energetic characteristics. The overall tension in this performance, which reminds me legendary 'Abraham's New Gift' from the album Alive, is really impressive mostly thanks to the mind boggling harmony between the band members. The bass solo in the middle of the piece is performed mostly from mid lines with many hits on the strings and the trio is like giving a masterclass on collaborative improvisation in European Jazz in this 9 minute-long performance. The piano meets us in the middle of the album by a naive and promising sound in 'Song For Lost Nomads'. Ivo Neame prepares the ground for the whole trio in his own composition. They all start to contribute as soon as our pianist decides to play the main theme which carry some spirits both from classical music and eastern mystic sounds. Anton Eger fills the background with sharp stick strokes on sides of the snare drums and he supplies the tension, which is sometimes asymmetric to the calmness of the piano and bass. Jasper's almost oriental sounding bow signals that, one of the best performances of the album - 'Wings 2 The Mind' - is coming to the stage. The title is again in an eye-contact with Plato and it carries the necessities of this heavy duty like dignity and perfection. The introduction part connects to an energetic area where the piano and bass are in an amazing dialogue which is followed by a clock like accurate drum-set. Jasper Høiby once again -with his solo- proves why he is one of the most important bass players in European contemporary jazz scene. I have to add that he created an amazing composition in 'Wings 2 The Mind'. The next piece 'Nine Lives' is another Jasper Høiby composition which reminds me the previous studio album 'Walking Dark' with a little bit spice of contemporary jazz scene in US. In my opinion such performances of Phronesis is the American side of the band, which may be the reason why we saw Phronesis in legendary Jazz Standard in New York for a while ago. 'Deep Space Dance' is from Ivo Neame and his introduction is like defining the space full of distant stars. Then we are leaving the earth through space with Jasper's nervous -but hopeful- bass riffs followed by one hand of the piano. On leaving Solar System we face other strange planets and their stars. There is a super nova illustrated by Anton Eger right next to our piano-black spacecraft. Then suddenly I remember the inspiration behind that album. "Music gives a soul to the universe, wings to the mind, flight to the imagination and life to everything." Let's see what kind of wings your mind will have when you will listen to this beautiful album.